The first German-language charity conference for Amazon seller AMZcare has raised € 60,000 for children with cancer. Sellics was there: Watch the free presentation by Sellics CEO Franz Jordan on Amazon PPC. 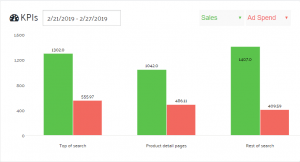 For Amazon vendors using our Retail Analytics dashboard, we have some exciting new feature updates to help you better evaluate your sales performance on Amazon. Vendors will see a huge improvement in performance with our new Content & SEO update—optimizing your Amazon content has never been faster in Sellics! You can now manage Sponsored Brands (‘Headline Search ads’) in Sellics. Amazon has just released an API update, opening up the possibility for advertisers to manage Sponsored Brands for the first time. Sellics combines the data from your key Amazon channels into one tool, and with our new Sales Performance Dashboard— give you insights into how these factors are influencing your revenue growth on Amazon. We’re excited to announce we’ve updated Sonar, our free Amazon keyword research tool. With over 52 million Amazon keywords in our Sonar database, you can take advantage of our powerful Amazon keyword database directly in your Sellics account. With our new Content Monitoring feature in Sellics Vendor Edition, Amazon vendors can now easily track all changes made to their product listings.